Everyone is out there finding the best offers and deals by which they can get least possible price. So here is an Android App which will do the same work for you. In this article, we'll check out the features of Zerch app by Mahindra Comviva. Due to digital transformation and more E-commerce stores like Flipkart and Amazon, there has been a revolution in the way we shop and buy anything. With this, the offline traders and shops are facing tough competition. So they are also out there going for head to head competition by providing discounts and other attractions. 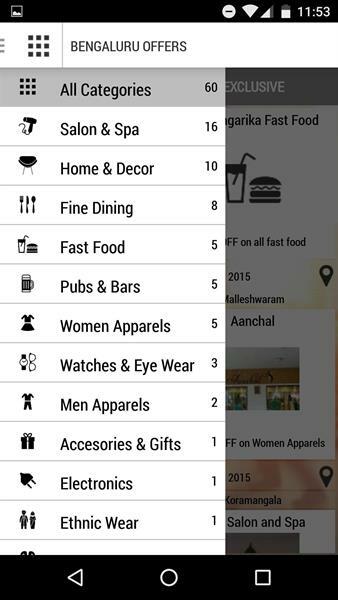 So let's see what this fuss around here has given birth too - Zerch App which will give you the latest deals and offers for offline stores. 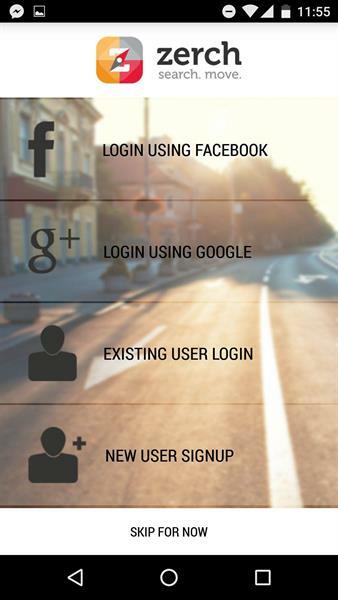 Zerch App will provide you with a nice and smooth interface with some eye-catching colors and hazel free navigation. 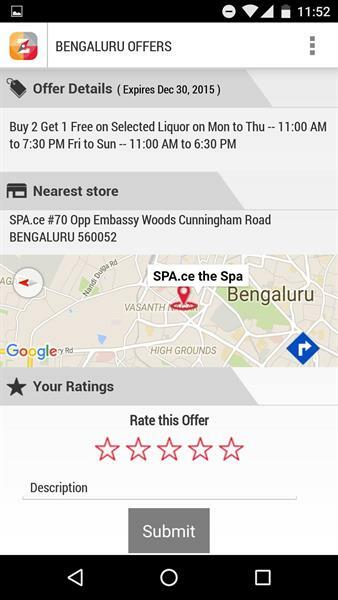 When you open the App this will be the interface which shows all the offers at your nearest stores. ( At present only available in Delhi, Banglore and promised to extend their service to fall the cities). It will ask you to enable location before entering into the App. You can see the clear navigation in the first look itself. It consists of a left & right navigation and a subheader navigation with All offers and Exclusive differentiated. Left sidebar will provide you with all categories like Salon & spa, clothing, furniture, fast food, hotels, luxury etc you can find over here and you can see the number of offers in the individual categories just beside the category name. The number of categories depend on the city you select and you can see deals & offer of a specific category or the individual over here. When you select an offer in that you will be presented with a screen titled the offer and when you scroll down you will get Offer details and the nearest store with navigation to stores with Google Map instructions. After taking this offer, you can also rate this offer and write your own review about this offer. This is a very good option, you can get honest reviews before visiting the store. In the top bar, you will have a search option to search for your desired offers if you find it hard to locate in all offers. In the right sidebar, you will be provided with options like Nearby offers, City selection, My coupons, Invite friends, Settings, Sign In. Nearby offers will show you the best offer by accessing your location, you should enable your location settings to show this and by scanning all the stores around your location, you can get the offers & deals of them. 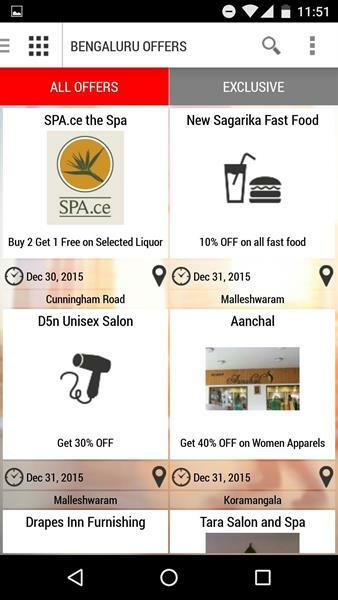 Coupons which you have used and the city which you want to explore can be changed from here. At present, only Bangalore and Delhi have this facility and they stated that they will extend their service to all the cities in India. You can invite your friends though there is no referral program in it and you can log in to your own account, you can create your account using Facebook and Google plus. This App is for those who don't rely on Online shopping but still fancies discounts & deals, so this will provide an interface between that deals & offers with offline shopping and rated 4/5 in play store with 1 lakh downloads. This app is still in its initial stage, so you can expect more features and updates added to it.